Send warm buttery wishes to the movie lover in your life! We've included everything they need for a fantastic vintage-themed movie night at home, from gourmet ingredients to a beautifully handcrafted bowl and of course, the genuine Whirley-Pop (in stainless steel!). Handcrafted Hardwood Bowl: 100% bamboo with cut-out handles at each end and a gorgeous charcoal glaze. 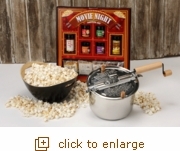 Holds approximately 6-quarts of popcorn and measures 13" x 10" x 5".